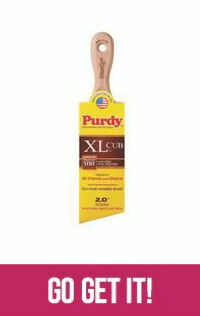 Ask Sherwin Williams... What are the most Popular Paint Colors? - Happily Ever After, Etc. 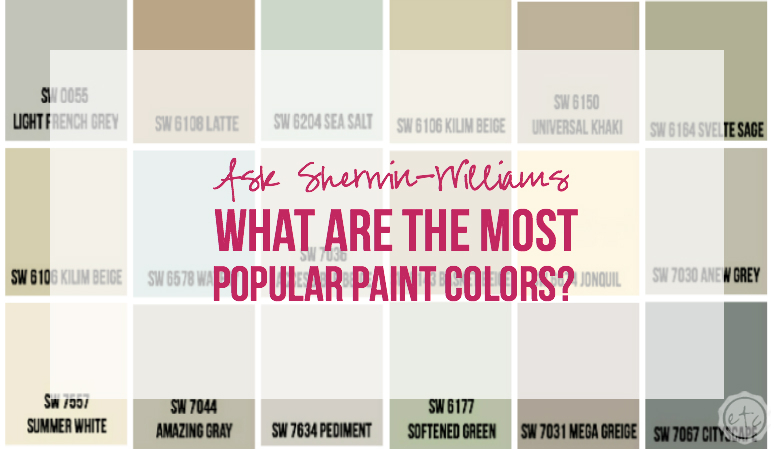 Ask Sherwin Williams… What are the most Popular Paint Colors? I’ve mentioned a time or two that I work at Sherwin Williams right? Yup I’ve mentioned it a lot… honestly I need to have a whole Sherwin Williams tab on this blog! I suppose that’s what happens when you’re into home decor and you work at a paint store… work kind of goes home with you. Literally… I come home most days covered in paint! I would say Softened Green (sw 6177) or Svelte sage (sw 6164) for greens. Beiges… Kilim Beige (sw 6106), Universal Khaki (sw 6150), and Basket Beige (sw 6143). Greys would be Anew Grey (sw 7030), Cityscape (sw 7067) and Mega Greige (sw 7031). Yellows are Restrained Gold (sw 6129), Blonde (sw 6128) and Jonquil (sw 6674). Kilim Beige (sw 6106), Dover White (sw 6385) and Tricorn Black (sw 6248)! VERY popular colors! Watery (sw 6478) … Sea Salt (sw 6204)… Light French Grey (sw 0055) and Summer White (sw 7557) are tied right now! Kilim Beige (sw 6106), Latte (sw 6198) and Sea Salt (sw 6204). I have a list… and the top three colors are Kilim Beige (sw 6106), Extra White (sw 7006) and Latte (sw 6108). 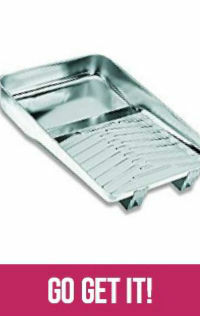 The Essentials Fold-Out is really popular! It’s still Kilim Beige (sw 6106), Accessible Beige (sw 7036), Pediment (sw 7634) and Amazing Gray (sw 7044) … although if you’re looking for a little color Sea Salt (sw 6204) is great. Neutrals are hands down the all time favs… Kilim Beige (sw 6106), Perfect Griege (sw 6073) and Dover White (sw 6385). There you have it! Ask Sherwin Williams what paint colors are the best? Kilim Beige (sw 6106) is definitely the winner… followed shortly by Latte (sw 6108) and Sea Salt (sw 6204)! Neutrals are definitely killing it this year… but we already knew that :). I would say yes and no lol. I love a soft, pale, neutral gray. But when it comes to the tans and browns, they are really not my thing at all. I love the bluish green colors and beachy feel from paint. This was a super fun post. I love seeing what other people pick when it comes to paint! Can I tell you a secret? If it was up to me the color beige wouldn’t exist! I know people love it (boy do I know! I sell gallons and gallons of kilim beige!) but it’s such a boring color! I would much rather sell a gorgeous gray like online or a soft blue like bracing blue… but those colors aren’t for everyone! For every hand there is a glove… I just wish less of the gloves were beige! Thanks for stopping by Danielle I loved reading your comment! I agree. Beige is nice, but I like A soft Yuscsn look myself. We use Covington Gray (if that’s how it is spelled) everywhere… my brother is a painter and so SW & BM are household names here…..kind of like a family members. I completely understand! Painters live and breath paint… so it’s no wonder you’ve been sucked in! Thanks for stopping by Leslie! Isn’t that a dreamy color? So light and airy… makes me feel like summer time at the beach! Thanks for stopping by Audrey! I just love to say Jonquil… it’s such a fun word! Haha! Pretty color too 😉 Thanks for stopping by! I love this post! We are repainting some of the house and I will definitely be going back to this list. Repainting is always a tedious task… we are almost done with our house right now! Good luck and I hope this list helps! Thanks for stopping by Haley! love the sea salt colors! Sea Salt is soo pretty! Our bedroom is silvermist which is very similar to sea salt… so I’m definitely a fan! Thanks for stopping by Nikki! Renting can be such a hard place to be in… luckily our landlord agreed to let us paint. I don’t know that I could handle a dark color I didn’t pick for my living room… if they aren’t going to let you paint they should have the house painted neutral! Although I suppose I can’t talk… our landlord has green cabinets and red counter-tops in our kitchen! yikes! Thanks for stopping by Leah! Sea salt- hands down one of my absolute favorite colors! Sea Salt is so pretty… it should have been the color of the year! It’s way more popular than our coral color of the year or Panatone’s marsala! Thanks for stopping by Stephanie! What a great list! 🙂 I’m planning on painting our living room soon, but we’re not 100 percent sure about the color yet. Thanks for the inspiration! Both, Restrained Gold and Amazing Gray are both in my home… But, Im an interior decorator so I guess that’s why.. LOL.. I love amazing gray! Good to know a professional decorator stands by these colors… thanks for stopping by Nakeya! We’ve been thinking of repainting before trying to sell our house so this is very useful – thanks! I’d have picked something lighter along the lines of Summer White / Jonquil, but our house already is mostly the beige and green colours you’ve got as most popular, so maybe I shouldn’t repaint after all! People love that kilim beige… If you have anything like that you’re probably fine! Haha! It seems like that’s what most rental houses are painted these days! Thank you so much for stopping by! good luck selling! I completely agree… I hate beige! Haha! That’s what everyone likes though: neutral neutral neutral! I grew up an army brat with stark white walls… Beige would have been an improvement! Felt like a hospital! I suppose that’s why I like a little color… Sounds like you do too! Thank you so much for stopping by! So much beigeeee! Great post though and I didn’t realized you worked at SW so cool! Haha… Yup good old SW! Beige is everywhere these days… I think people are scared of color! Haha! Thank you so much for stopping by Becki! Those are my favorite as well Sue! I already knew that blue and grey were my favorite though! Thanks for stopping by Sue! so I just found this blog (love it Betsy) and being the passionate color nerd and a Sherwin William’s fan as well as an employee, I have to put my two cents in. Let me just say to those of you who struggle to find the “right” color, there is no wrong answer. Color is a personal choice. As long as YOU love it, it’s good. I loved the survey. It is interesting to see how we all perceive these colors differently. From what I see everyday at work, yep beige still reins. But that’s not to say Beige is most popular. I think it’s a comfort blanket and and the go-to color for people that are afraid to make a decision. Twenty years from now gray will probably be the comfort go-to color. But just because it’s dated, it gets an unfair wrap for being boring. Oh contrair! Gray may be “modern” and fresh and clean BUT, I think it could be boring too. Now gray and beige TOGETHER…. Bam! That’s the cat’s meow. Classic. Warm. Interesting. Neutral. So I say don’t discount Kilm Beige so quick. It just needs some gray to breathe life back into it. My favorite these days is Kilm (or most any beige) on the ceilings and gray on the walls. Painted ceiling or lack there of is a whole other touchy button with this (according to my husband) paintaholic. People, PAINT YOUR CEILINGS and I don’t mean white! Paint them good ole Kilm Beige, Canvas Tan, Natural Choice … There are soooo many neutral choices and they all compliment and warm up the grays. See, get me started on color and I can’t stop. I love this subject. Bravo Mrs Betsy on a fun subject and a great blog. Glad to have found you. I love amazing gray! I tend to lean towards neutral colors for resale – and then I put lots of color in photographs on the walls! That’s a great trick Alexandra, especially if you know you’re going to sell! Thanks for stopping by! Just found your post, and absolutely love – what a wonderful resource that will definitely be sure to reference! We just did our hallway bathroom Sea Salt and are very happy w/ the way it turned out. Now in the process of trying to figure out paint colors for my daughters room – 3 and 8 months (need to finalize tomorrow) – planning to do one pink (3 year old) and the other purple. Think have narrowed down the pinks to Diminutive Pink and White Dogwood (any thoughts on these? leaning to WD b/c seems more subtle) BUT having a hard time picking the purple shade. and everything is starting to blur. The room is relatively small, facing the side of the house/not getting a lot of light, so looking for something w/ a tinge of lavender/nothing too dark./somewhat neutral but still girly..have already tried Spangle – SW – 6834 (way to bright,) Silver Peony – SW6547 (which thought was going to like b/c PB Kids color, saw some online room makeover overs, but looks kind of dark for this room,) and Whimsical White – SW6826 which think has potential to look nice once on all four walls, but not sure if too light and kinda of coming across as pink – Any recos for a popular/neutral light purple shade from SW? 🙂 any help/advice would be greatly appreciated as we are already have a ton of testers and think my husband will kill me if i buy another one. Thanks so much. I just saw your post… I don’t know if you’ve already bought your paint (you said tomorrow which would have been today) but here’s my two cents worth. I have seen Diminutive Pink and it definitely looked more bubble gum pink in the room I was in…. White Dogwood is definitely a lighter, more subtle shade. Very subtle yet sophisticated which will work with a little gal as she grows. As for a purple that is a bit lavender not to dark neutral but still girly… try Ponder sw 7079 or Minute Mauve 7078. Minute Mauve is just a tidge lighter than Ponder but it’s a very subtle light lavender color with a tidge or gray that will work with pops of brighter colors in the room and still read as neutral. Hope that helps… I definitely want to know what you picked! Good luck at fighting off the sample monster… those little cans can definitely multiply! AND we are also doing my daughters bathroom (the pink room – which so relived that you confirmed my thoughts on White Dogwood as we decided to go with that!) – and wanted to do a light green without being too minty…I originally had narrowed down to Cascade Green (0066) as thought a nice neutral green, but when the painter put on the wall i was shocked at how darker it looked..we had also tried Gratifying Green before that, which in my opinon looked too pastel (not the look going for)…so SW rep recommended Sagey, which is what originally thought i liked, but thought may be too light – any thoughts on this? Hoping its not too light/yellow, but thought it was a nice complement to the White Dogwood without being too sophisticated for a little guy. The bathroom is all white and gets a lot of sun…. A lot of the other greens i was looking at seemed like they had even more yellow/gray/beige undertones in it which didn’t want. These are wonderful colors -soft and natural. I’m very much a nature inspired paint person (does that make sense?) so I love Soften Green (master bedroom), Sea Salt (guest bathroom). I have been looking for just the right khaki for the guest bedroom and I think I found it with Latte. Isn’t it funny how some colors “speak” to you and others absolutely turn you off – you don’t like beige (and to honest I am not usually drawn to beiges either) but I absolutely detest gray. I think that is the most depressing, un-color there is, but to each their own – ?. It’s amazing how different people love different colors! I absolutely love grey… and cannot stand beige! I always say that it doesn’t matter what other people like… as long as you love you’re home that’s what matters! Thanks for stopping by Carol! Hi! Love this post. Was wondering if any of these golds or if you could recommend a gold to go with really dark kitchen cabinets. (Decora teaberry color) ? The gold we sell the most of is Restrained Gold… although it’s hard to recommend a color without seeing the cabinets! Good luck hon! Thanks for stopping by! I am updating my adult boys bedrooms. They are away in college and have outgrown the Eagles, Penn State comforters and paint colors, dark blue and green. I want an updated neutral, clean fresh look because I don’t know if they are leaving or staying upon graduation this year. So, I guess I am asking for an opinion on some neutral gray and beige colors to complement. I will paint one room greys and the other beiges. Please include ceiling colors. I am so overwhelmed with choices and don’t trust myself. Thanks for your help and I look forward to hearing from you. I love love love light French grey and neutral tan. Light French Grey is a true grey that doesn’t lean towards blue or red so it’s great with a variety of colors. Neutral tan is slightly more tan than your normal beiges which compliments the grey tones. 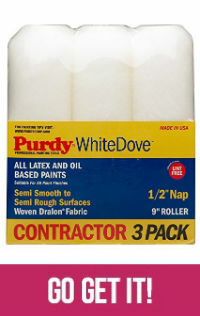 I would use extra white on the ceilings. When you’re going with lighter colors i prefer a light bright ceiling that gives you a bit of contrast. Thanks for the very insightful post! It is nice to see what others tend to lean towards even though we each have our own distinct tastes. I am about to paint a whole house and I have had a difficult time gauging the right default color that would connect all the rooms, etc. I lean toward blues and have a very very light blue white in my office which I love. I thought I could go a little darker at home and got chips of Upward, Niebla Azul, Icelandic and Rain. I would like a sophisticated but subtle and non-heavy/ dark color. When I made a poster of Niebla, it came off way darker than I like and too green/ gray. I thought I’d ask you before I purchase more samples. Any suggestions for a bluish light for default on most walls in the house? Any pointers would be greatly appreciated. Thanks! Have you tried online? It’s kind of a blue/grey and reads as a neutral while still giving you a blue light! Good luck… can’t wait to see what you end up with! You won’t believe this, but we purchased a new home, and I have been choosing paint colors for the entire home. I went by the store and picked out samples. I have looked online at numerous photos of rooms that people painted in the colors I liked. I am very OCD and have spent hours, days on this. I finally decided on my colors and emailed the final list to my painter. I was still doodling on my computer and found this article, only to find that I chose the top colors! I chose Latte, Sea Salt, blonde, and my trim and cabinets will be extra white. You have confirmed my choices, and I feel so good about them. Thank you so much. I’m so glad that you feel better about your picks… I love your choices! I bet your home looks lovely! Thanks for stopping by hon you made me so happy today! 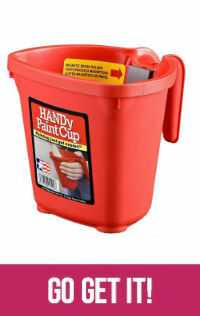 This is the most helpful paint related blog post I’ve ever read! I will definitely be pinning it. We painted our home when we moved in 6 years ago, but it’s looking a like it needs some freshening. New paint would be just the ticket! You’re so sweet! I’m so glad that my tips helped you in some way, I hope you’ll share pictures when you’re finished painting! Thanks for stopping by Laura! Which would you use for a laundry with white washer dryer and oak trim (2 doors) and 1 window. But I like most all of these colors. And would you use Svelte Green for man cave/basement family room? If you’re looking for a neutral that isn’t beige or gold try grey! I love Passive or Light French Gray… Passive has a slight blue undertone whereas Light French Gray is a true gray with black undertones. Svelte Green on the other hand is a gorgeous color! I’ve seen it several times and if you love green it’s a very pretty option. If you’re looking for something a little lighter try Contented. Good luck! We love our SW Oyster Bay kitchen and SW Network Gray bathroom. Now looking for ideas for our Family Room! I’m looking for a nice gray on the lighter side that pairs well with a refreshing love light blue that does not scream baby boy’s room. The gray is for a living room and the blue to be used in the kitchen and accent wall in the living room. Hi Sheila! It sounds like you’re having a hard time finding the perfect neutral color, rice paddy has a green undertone which may not play nicely with your oilve green sofa. Maybe that’s why you didn’t like it? Try a true neutral like Natural Linen or Light French Gray. Although a slightly off neutral might be nice with your combinations… while you’re at it grab a swatch of Mega Greige or Tony Taupe. Try holding the swatches up in your room and see what you think… good luck! Im redoing the master bedroom. Im thinking about amazing gray. Its a large room that gets alot of light. Im wondering what undertones are in it and worried if itll be too dark. Does it tend to be more gray or beige. Not a fan of beige. I used watery and sea salt in the guest room snd absolutely love the colors. I am wanting to repaint a bedroom & bathroom. Currently the whiles are a dark tan….makes the room dark. The tile in the bathroom and granite top are both in the brown family. I love grays….can you suggest a color to use…..I just want to lighten up the area!!!!! Try accessible beige or natural linen… they’re based in brown but will lighten up the space considerably! Hope that helps!